This is a system I’ve used for years with great success and it’s so easy. Even if you’re a beginner gardener or on a budget and need a thrifty solution, this is it! An easy container garden with just a few ingredients to get started. I succession plant in new boxes regularly so I continually have a delicious variety of food crops to harvest for our table. A table or workbench. I line mine with some newspaper to keep it clean while I’m putting my micro garden together. 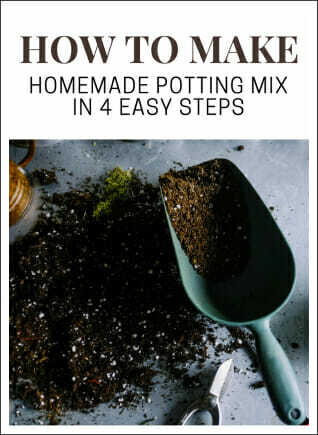 You’ll need gloves, mask (for use with potting mix) and a trowel. 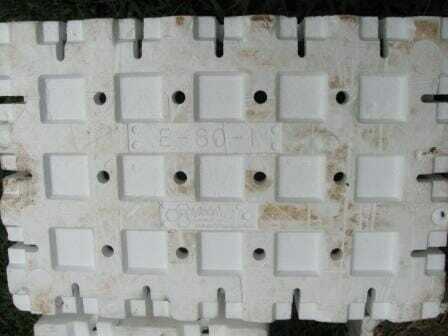 A new or undamaged, clean polystyrene box. Tip: I get mine free from local green grocers, but you can try fish mongers or stores that sell fresh fruit and veggies. You’re doing them a favour by repurposing boxes that would otherwise end up in landfill. Alternatively, choose a container you have easy access to. These come in a variety of sizes and depths and can be painted to suit your taste like I have here! This box is approx 45cm long x 20cm deep x 30cm wide. Choose a box that has holes already. Bean & corn boxes are fantastic choices (20cm deep) or broccoli if you want a 30cm deep one. A suitable quantity of potting mix (I make my own). 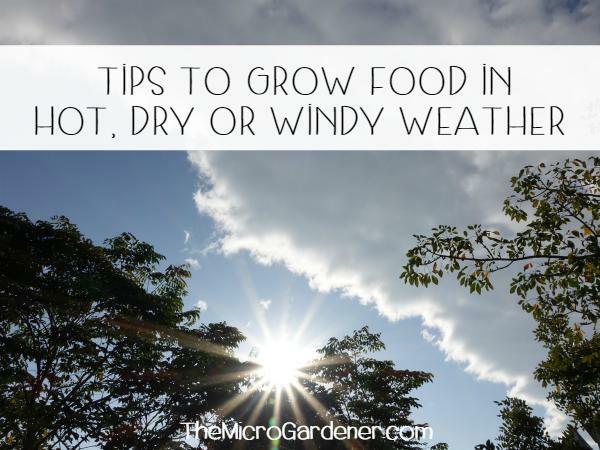 You can use my easy DIY recipe but I suggest you include suitable soil food like I do, so your plants are off to a healthy start. This is an easy project for kids too. Get them to paint their box in fun colours or designs. Paper towel (about 4 sheets) or other suitable liner such as an old clean tea towel or cotton fabric. Watering can with liquid or powdered seaweed and about 1 tablespoon of molasses to feed the soil microbes. 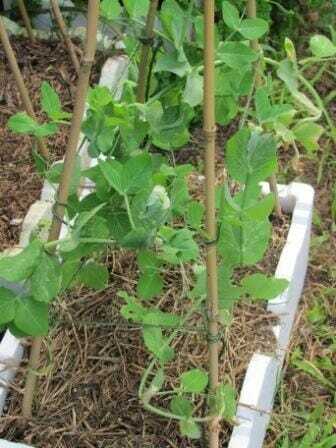 Selection of healthy seedlings (if you choose to grow climbers like peas or beans, you may also need a tepee or support stakes with ties). 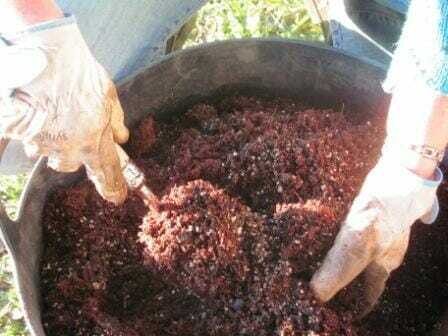 A few handfuls of organic mulch e.g. 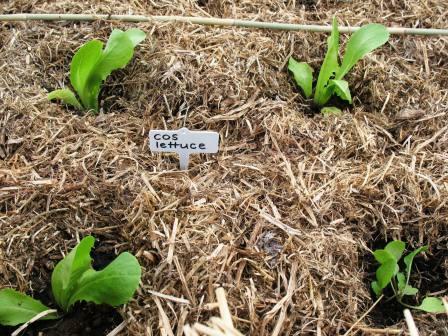 coir peat, chopped lemon grass or aged lawn clippings/dried leaves. I often use sugar cane or lucerne because these add vital nutrients and are chopped fine which makes them easy to handle. You can use grass clippings, chopped lemon grass or whatever you have handy to maintain moisture and regulate temperature. Optional: Shade cloth or exclusion netting (depending on your situation and climate)! Wearing your gloves and mask, line the poly box with a couple of strips of paper towel to cover the drainage holes in the bottom and prevent the potting mix escaping. 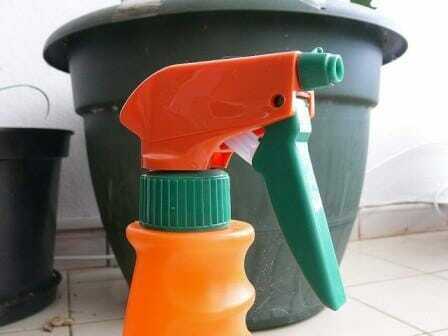 Tip: I mist the paper towel with some water from a spray bottle to moisten before adding the soil mix. 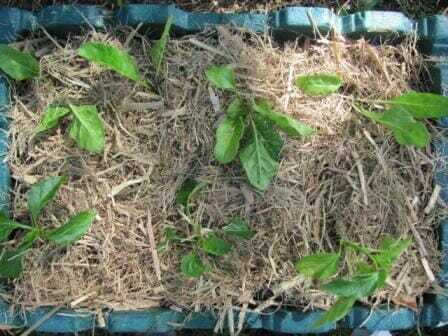 Tip in sufficient potting mix to sit about 1-2cm (1 in) below the lip of the box. This is my light and fluffy home made potting mix. Tip: It will settle down after you water in so best to have it a little high. 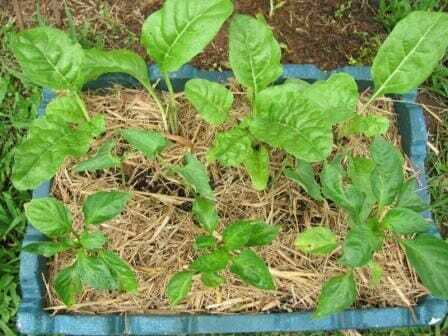 Garden in a Box after planting 4 x spinach seedlings at the back & 3 x capsicum seedlings at the front. Below: Garden in a box a week later. 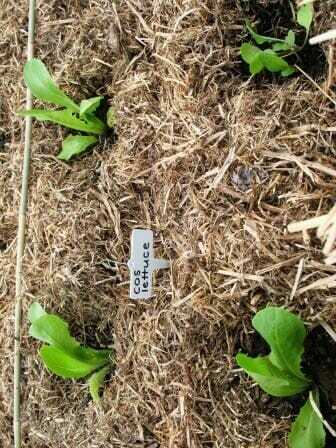 You can see the spacing is suitable as they start to grow. In the middle are 2 small bean seedlings which I transplanted after using this as a temporary nursery until I got another box ready. Tip: Pat down firmly so all the root hairs are in contact with the soil. 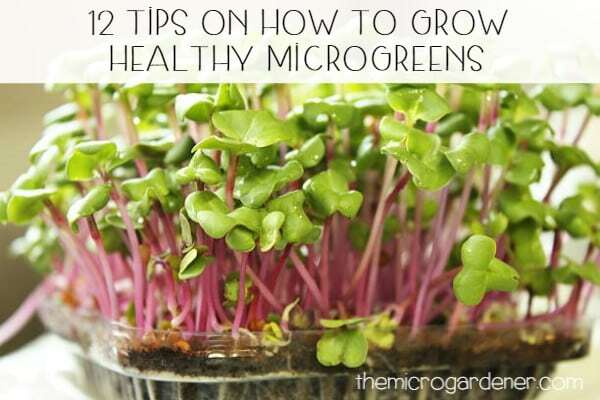 Repeat until all seedlings are planted and then water in with seaweed/molasses solution. 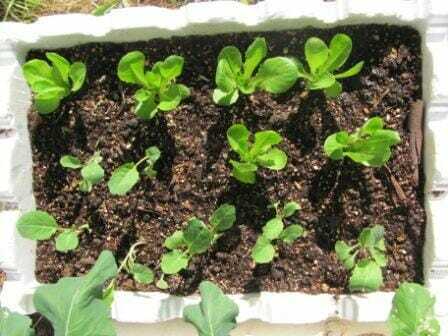 Fast growing salad greens can be planted close for maximum use of space and then rotated with another crop when they are finished. Finally top with a few handfuls of mulch (about 2-3cm deep), leaving about 1-2cm (1 in) gap around the stem of each seedling. Celebrate your new garden – add your plant labels! 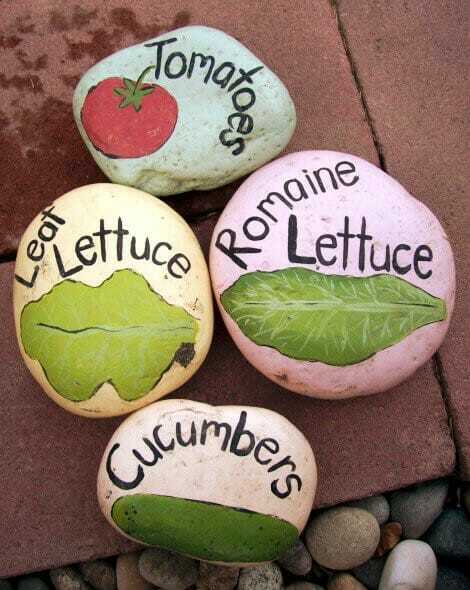 Add some garden art or home made plant labels like these painted veggie rock garden markers. Use a Moon Calendar to plant at the optimum time for an abundant, fast growing healthy crop. Baby Love: Just like you wouldn’t throw a baby into a cot, you need to handle your ‘baby plants’ with care as they move from one ‘bed’ to another. 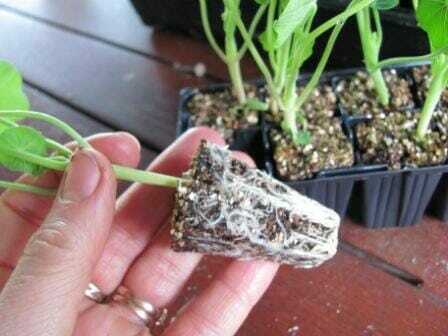 Hold the seedling by the leaves (the strongest part of the plant) to avoid damaging vulnerable roots. 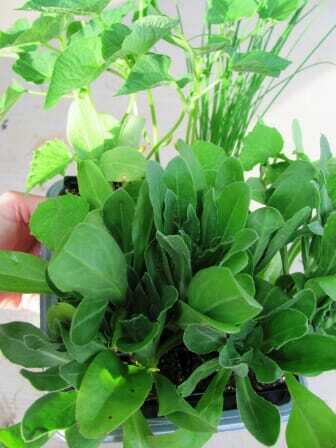 Vertical Veggies: Want to grow climbing veggies like peas, beans, tomatoes or cucumber? 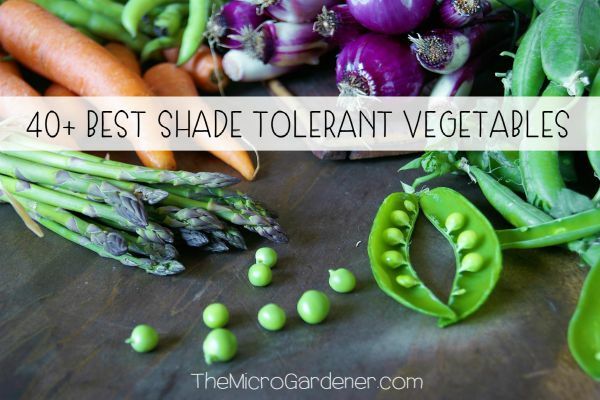 Easy – add a tepee (get my free instructions on making yours from bamboo stakes for under $1) or portable A-frame trellis to your Instant Veggie Garden. These snow peas grew really well up a four-legged bamboo tepee I made with one stake in each corner of the box. Good Looking: Want to make it prettier? 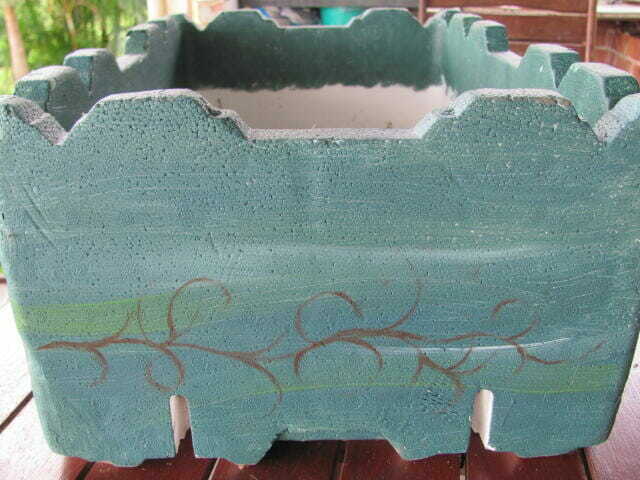 Get creative and give the box a coat of non-toxic eco-friendly paint or choose another container you like better. 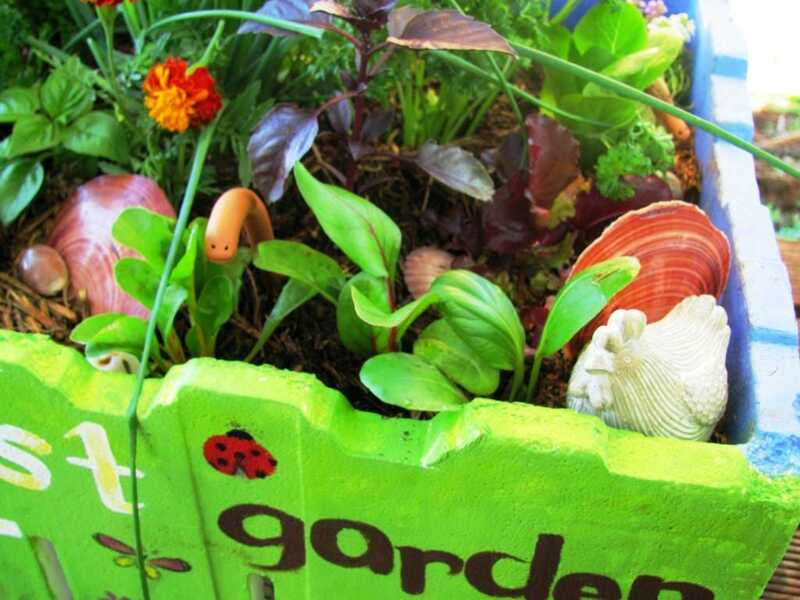 Use your imagination to make a garden in a box as a gift for someone. I made this colourful one for my daughter. Complete with decorative shell mulch, garden art and a clay moisture meter worm! Potting Mix: If you choose to buy a bag of organic potting mix, you’ll probably need around 15-20kg depending on the size of the box you use. 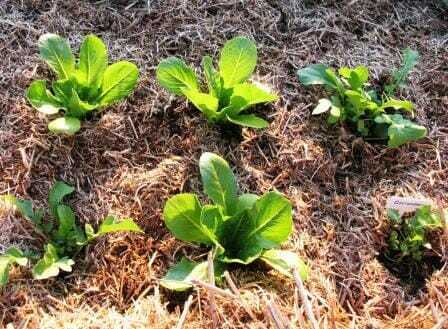 Remember to add soil conditioners to feed the plants. 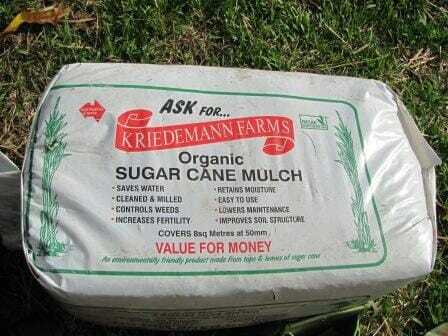 I add these to my home made potting mix to save time when I want to start planting my garden. 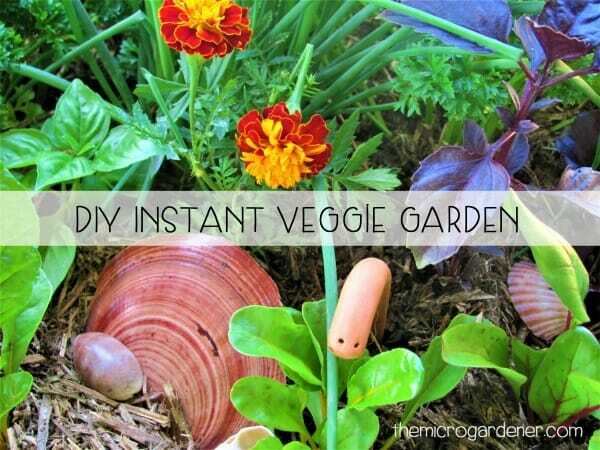 You’ll be amazed just how much you can grow in an Instant Veggie Box Garden. Have fun! 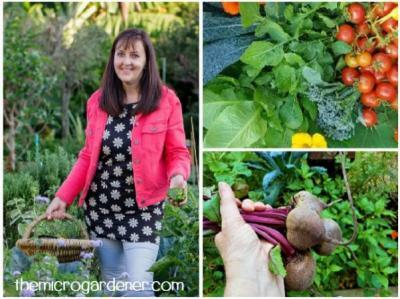 In Part 2, I show you how to grow a variety of plant combinations in these micro gardens for best results. Related: Micro Gardening; The Benefits of Container Gardening; Getting a Small Kitchen Garden Started; Choose the Healthiest Seedlings; Harvesting Vegetables & Herbs & Tips for Growing a Garden in Pots. I really enjoy your blog, there is so much helpful information. Right now I only grow a few herbs in containers in my backyard, I really like snipping off what I need to add flavor to a meal. I don’t have a vegetable garden in the ground because I will be selling my home soon and are planning on purchasing an RV, living full time in it and traveling around the country visiting and working in various National Parks and other locations. My point of all this is that I would like to try to grow some plants in my RV, if I have enough room and light coming in the windows. Do you have any suggestions as to what plants would do well in these conditions? Can I get much variety in only a few pots. Thanks Louise – look forward to checking it out and discussing some options for you to meet your goals. I have just arranged a consultation with you to further explore some options. I have also made a short video showing you my dilemma…. It’s not easy finding garden bed solutions that are problem or chemical free – even colorbond (though coated) will corrode when in contact with moist soil in time. Had this happen in my garden. Hardwood seems a good investment as it’s longer lasting without CCA treated chemicals. There are eco wood sealers that make this a reasonable option. Good luck with your research. Glad to help. Thank you so much for taking the time to write such a detailed response! Lots of food for thought…. I am in the process of deciding what to do next but have decided to start again and move away from coating the polystyrene boxes, and either make my planter boxes from colorbond or hardwood. Hopefully this will give me organic, and not carcinogenic, veggies. I will let you know what Plan B is after continuing to read/research more! Thanks again Anne for sharing your knowledge so freely, and if I have any more questions I will be sure to request a consultation with you. Thanks for a wonderfully informative site…. Today I went on an organic gardening course at the Kimbriki reuse centre and showed the tutor a pic of my garden. Her comment was that there was no way she would grow veggies in polystyrene as it leaches out styrene and benzene! I’m quite devastated and am trying to understand the risks…. Your article talks about veggies in polystyrene containers though elsewhere on your site you mention to avoid containers made from polystyrene, or recycle number 6. I would be most grateful if you could please could you let me have your thoughts on what seems to be a contradiction… I’m now wondering if I can paint the inside of the polystyrene boxes with a pond sealer (supposedly safe for plants and fish from Bunnings) or if I should abandon them and make wooden planters or use grow bags instead! Thanks for your feedback about the site and your questions. 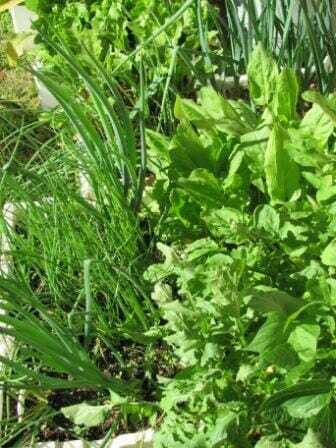 It’s great you are thinking deeper about your food gardens. Congratulations on making the effort to get them going! I’m not sure where you’re located but polystyrene wicking beds have become popular since Roman Spur promoted them on Gardening Australia. My goal is to provide useful, practical and sustainable solutions, and well-researched articles. This requires a balanced, thoughtful approach! 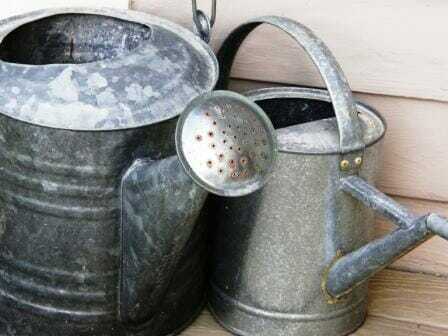 There are some materials that are definitely off the list to use as far as I’m concerned and others, that when used correctly, may be reused as containers or used in your organic garden. I have done a lot of research into various materials used for both new and upcycled container gardens, the environmental effects and issues, toxic chemicals, hidden dangers lurking in our gardens, growing safe food, etc and have a huge library of research material/studies/academic papers on file. I try to find research papers or credible sources that provide insight into the likely safety or risks, so I can make an informed decision. Obviously this takes a lot of time and dedication and the average home gardener doesn’t usually go to these lengths. They just want to get a garden organised and grow a few vegies! I feel obliged to do my due diligence and whilst I’m not an authority on the subject, I’m happy to share what I’ve learned in the hope of helping others make their own decisions. Based on the research I’ve done to date, polystyrene boxes (when new and undamaged) don’t appear to be prone to leaching styrene as the mould is intact. However, it’s when you start punching holes in the box (such as to insert PVC tubing for wicking beds) that the beads become separated from the mould and my understanding is that this is how the leaching can occur. I believe the integrity of the original polystyrene mould can also become compromised if the surface is painted with some sealers (these are another subject altogether!) or if they become damaged (e.g. like my enthusiastic hubby with the whipper snipper). I’ve seen TV presenters and gardening speakers demonstrate punching holes in polystyrene boxes and I know this is not a safe practice. The styrene can be inhaled and then it is in direct contact with the soil, water, plant roots and microorganisms. 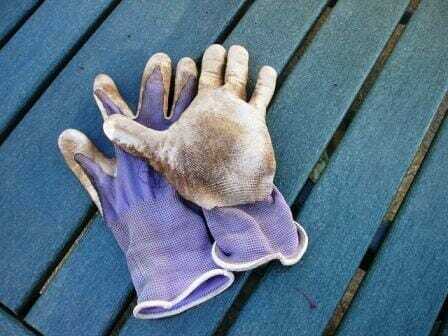 Sadly, they never wear a mask when demonstrating this either, so home gardeners have no idea they could be innocently creating a health hazard. If painting your boxes, I suggest investigating zero VOC, eco-friendly paints/sealing products. Boxes can be lined, but if lining with plastic, then you’re back to square one again! Natural materials are an alternative such as landscape fabric (can be expensive) or you can reuse natural fibres like potato sacks and hessian bags etc. There’s an excellent website where you can learn more about textiles and toxic issues called OEcotextiles. I also suggest you read the comments on my article Choose Safe Containers for Growing Food – there are many questions already answered in the comments section. The polystyrene boxes used in my demo as outlined on this site are clean, new and undamaged. The holes in the base are already there as part of the original mould made during manufacturing. During my research, I found studies that showed acids (such as from lemon, orange and other citrus food waste) could detrimentally affect the integrity of the polystyrene mould. i.e. cause styrene and possibly other chemicals to leach. I personally DO NOT recommend making either worm farms or wicking beds out of polystyrene boxes for this reason, especially if feeding food scraps to your worms. I know some presenters have advocated this on Gardening Australia, but I don’t know what research they’ve done into the safety of such practices. Personally, I would prefer to err on the side of caution i.e. apply the Precautionary Principle! I’m assuming in your wicking beds, you may have used PVC pipes. If not, great! PVC is another toxic product that in my humble opinion has no place in an organic garden. And yet, it’s widely promoted on Gardening Australia segments by various presenters as the bee’s knees solution for worm towers, wicking beds and vertical gardens. I cringe. I hate seeing this because I believe programs like that with celebrity gardeners who should know better, shouldn’t be encouraging people to use these materials. Problem is, PVC is cheap, widely available and an easy solution. It takes creative thinking and a bit more effort to find safer solutions, but I believe it’s still possible. I’m not a fanatic. I reuse all sorts of materials around my garden to be sustainable, prevent them ending up in landfill and to tread lighter on the planet. However, over the years as I’ve learned more about the toxic components of some ‘innocent looking’ additions like car tyres, I believe the public needs to become more informed and the types of inputs they use in their gardens. I checked out the Crommelin pond sealer you were referring to and rang the company direct. However, after speaking to them I don’t know whether that would be suitable. The technical officer did recommend an alternative, Exterior Grade Brushable Waterproofer. I asked them to email an MSDS (Material Data Safety Sheet) which should provide more insight into any possible health hazards and active ingredients. You can also request the same. All companies should provide these info sheets for their products if requested and many are online. Grow bags are of course another alternative, as are wooden planters with pros and cons for both. See Choosing a Container – the Pros and Cons. If you have further questions, I’m happy to help you one-on-one with personal advice if needed via an online consultation anytime. What kind of paint do you use that’s safe. I love your blog!! I could spend hours just browsing and reading. 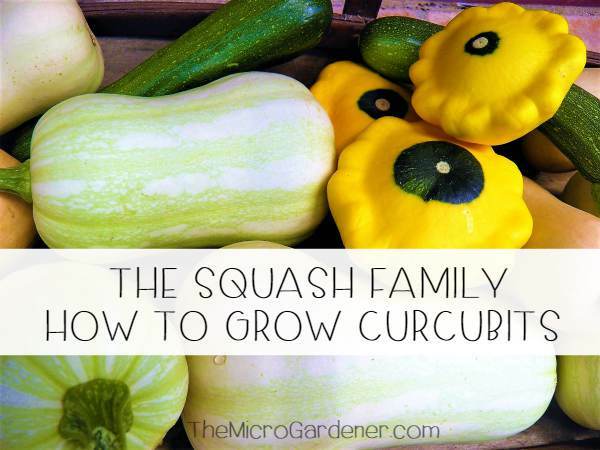 This post is close to my heart … growing veggies isn’t as hard as people think and starting out as you’ve suggested is perfect! I’ve added a link to this post in my “Meet & Greet” series … I think readers will love it! Thanks for all the great information and inspiration! OMG, I love all your ideas. Thanks a lot! Wow, I love this idea! my wife has been talking about doing this, I am sending her this link now. Thanks for your feedback and great to hear you’ll have some container veggies going soon. I’ve had to deal with possums when living in Brisbane – they used to walk along the timber fence making a bee line for the veggie patch night after night. I decided to work with nature and interrupt their visits by leaving them an alternative food source on the top of the fence before they made it to the patch. They seemed very satisfied with this arrangement so we both got a feed! There are pest repellant plants you might have growing that could also be useful to consider like chillis, lavender, quassia and eucalyptus. Penny Woodward’s brilliant book ‘Pest-Repellant Plants’ is a great read – maybe worth a trip to the library for details on how to use these and other plants in your patch. Lovely post (as usual) and very informative. 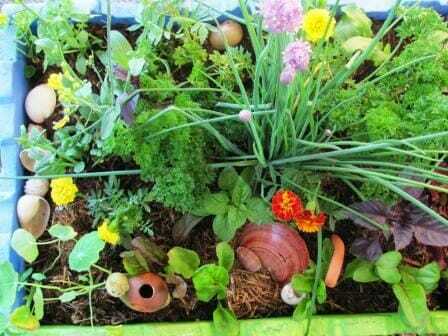 We are actually thinking about growing some veggies in containers like this to curb the possum problem that we have here at the moment. Anything young, tasty or vaguely palatable is being stripped bare and to avoid the sadness of discovering a garden bed full of only plant stumps where the day before there was a growing garden, and until we get our possum barriers built around our beds we could get some veggies happening in some polystyrene boxes. Great idea and cheers for the lovely pictures to accompany it.